Recently, Lancome sent over their Monsieur Big products for me to try out and review. The star product is the mascara but there are eyebrow crayons and an eyeliner included in the range too. I also received the Bifacil Makeup Remover and Cils Booster XL mascara base. The eyebrow crayons come in 5 shades - 00 Highlighter, 01 Blonde, 02 Chestnut, 03 Brown, 04 Ebony. They are $25 each with 1.5g of product. 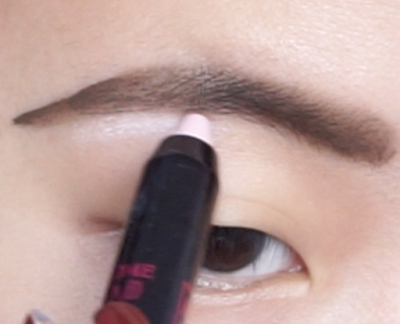 There isn't a spoole on this crayon but there is quite a dense kabuki brush to blend out the brows. The crayon tip is rather thick and chubby so it's really hard to be precise when using this. 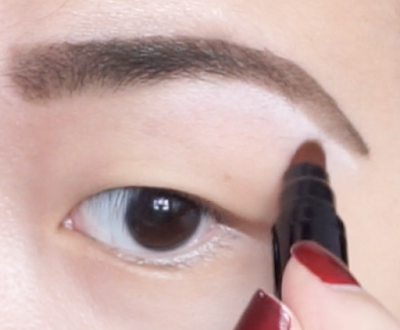 If you have naturally thick and bushy brows, this would be perfect to add dimension and volume to your brows easily. If you have thin and sparse brows, it's going to be tricky working with this, especially if you want a sharp and precise tail. However, I do enjoy the formula of this. It is pigmented and applies easily. The kabuki brush blends the pigment out very well. It lasts a long time on the brows if you do not touch them. They aren't waterproof and they do not set so it can be wiped off or it can transfer if you touch them. 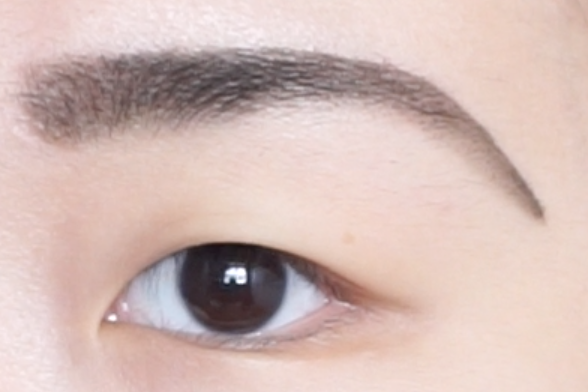 On the left, you can see my bare brows and on the right, you can see how it looks after applying the brow crayon. I used the shade 03 Brown. It's a tad patchy towards the tail because the tip is just too fat. You really have to go in light handed with this because it is really really pigmented and it can easily become caterpillar eyebrows. The 00 Highlighter shade is a pale pink with no shimmer or glitter in it. It's also really pigmented so it's really convenient and easy to apply this to the brow bone or inner corners. I wouldn't recommend putting too much at one go because it doesn't blend out a lot. So, work in small bits and build it up. I personally do not like the harsh white highlight if I'm not wearing any eyeshadow. The next item in the lineup is the Monsieur Big Marker which is an eyeliner marker. It retails for $25 as well with 2.4ml of product. The tip is really unique. It's a chiselled point with one flat edge and a pointed tip. 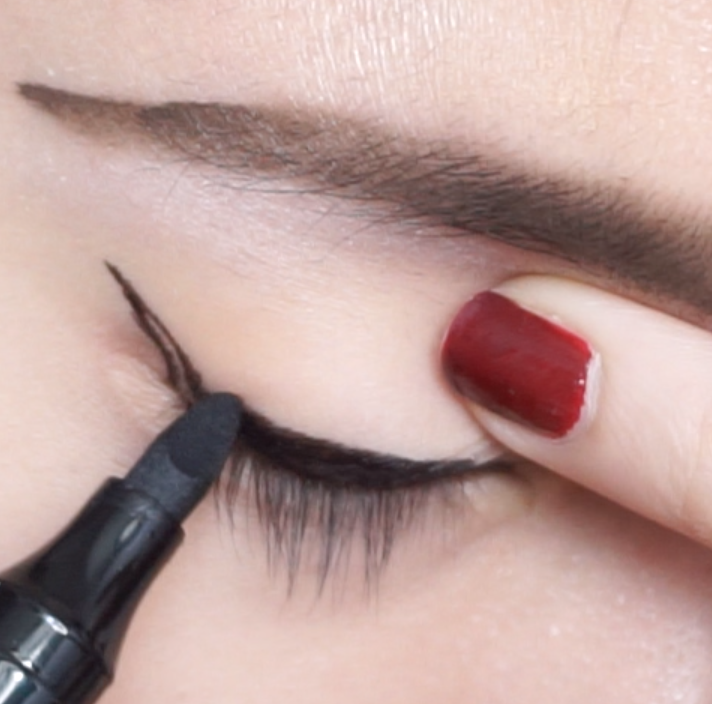 So, according to the picture, you're supposed to use the flat edge to line your eyes and flip it over to use the pointed tip to create your wing. Again, the formula is really good. It's so pigmented and black and it doesn't smudge or fade throughout the day. However, the waterproof claims do not hold up because I did a swatch on my hand it came off SO easily under running water. I think this liner would work best on double eyelids that do not have a lot of folds. 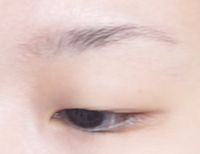 I have hooded monolids so there is a bit of fat that folds over and it's difficult to line them. I prefer to use a gel pot of liquid eyeliner. A marker liner would be fine too if the tip was fine like a brush. I managed to work it though, but it takes some time. Finally, we have the star of the lineup, which is the Monsieur Big Mascara! This retails for $25 for the full size of 10ml and $12 for the travel size. This tube is really huge so you get a lot of product. The lengthening and volume effect looks really good on the box. It promises 12x more volume with up to 24 hour wear. The applicator is a good size. Not too big and not too small. The bristles also look pretty normal. I used it with the Cils Booster primer over here, but I think I prefer how it looks without the primer. It looks a tad clumped but you can definitely see that the mascara lengthened and volumized my lashes. This removes easily without the need of an oil based remover so it may not be waterproof. However, I have not experienced any flaking or smudging while wearing this for a day. Overall, I really enjoy these products but I wouldn't exactly go all out to purchase these because they have not beaten out my holygrail products which perform better and cost less. Disclaimer: Lancome sent these products to me but this post is not paid or sponsored.